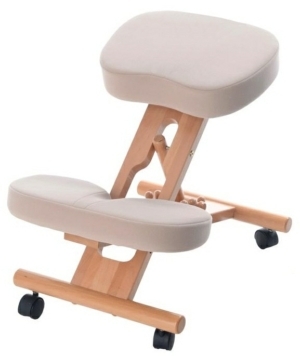 Our kneeling chairs provide an alternative sitting posture to prevent and manage back pain. By encouraging the user's hips and knees to be aligned at the correct angle, kneeling chairs reduce pressure on the vertebrae and reduce disc compression. 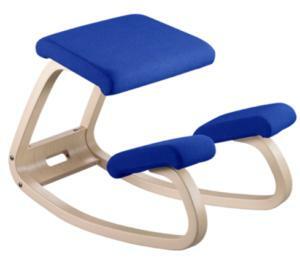 This helps to provide provide strain-free sitting and also helps to build strength in the core muscles. A kneeling chair is a stool type chair in which the seat slopes forwards and the knees are supported to keep the user in place. This encourages a more upright posture and removes strain from the lower back by distributing weight between the lower legs and buttocks. A kneeling chair also strengthens the core muscles to further encourage a natural posture. What is the benefit of a kneeling chair? A kneeling chair can be used by anybody that spends a large proportion of their day sat down. By using a kneeling chair in conjunction with a standard office chair, posture is varied to reduce strain on the back and improve posture. 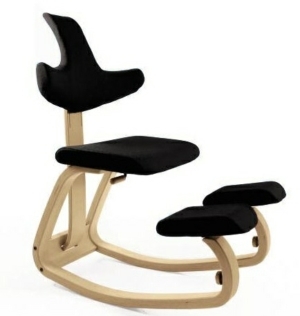 Kneeling chairs encourage the correct angle between the hips and knee which elongates the spine and reduces disc compression - helping to prevent against and alleviate spinal injuries..
Our kneeling chair range includes models from Varier and Putnams to encourage posture changes throughout the day.